FastPencil.com The Self-Publishing Workspace. For Writers. FastPencil empowers authors to write, collaborate, publish and sell books and ebooks from one workspace. The self-publishing application transforms one project into both classic and popular formats: a print book and e-book bundle (.mobi, .epub, .pdf). FastPencil removes inventory risk, allows any quantity to be printed on demand, and shares royalties (80% Net goes to the author). Pairing the do-it-yourself attitude with unique industry knowledge and established networks, publish & print privately or distribute to worldwide sales channels including Amazon, Apple iBooks, Barnes & Noble, plus more through a channel-agnostic, global distribution network. FastPencil covers it all: from inspiration to distribution. Start your free writing and collaboration account now at fastpencil.com and discover how easy it is to write, publish and sell a print book and ebook. Self-publishing simplified. This FastPencil Library book was published using the free author platform's "Memoir" themed interior book template. 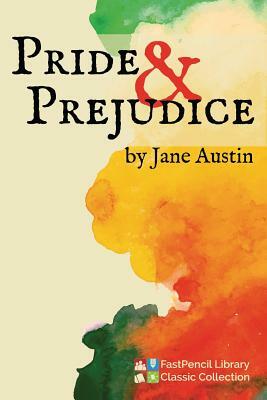 Please enjoy this re-publication of "Pride and Prejudice" by Jane Austen and keep this classic in your library, with our highest compliments. Browse books from thousands of FastPencil's published authors > fastpencil.com/marketplace. Thank you Pride and Prejudice is a novel of manners by Jane Austen, first published in 1813. The story follows the main character, Elizabeth Bennet, as she deals with issues of manners, upbringing, morality, education, and marriage in the society of the landed gentry of the British Regency. Pride and Prejudice retains a fascination for modern readers, continuing near the top of lists of "most loved books." It has become one of the most popular novels in English literature, selling over 20 million copies, and receives considerable attention from literary scholars. Modern interest in the book has resulted in a number of dramatic adaptations and an abundance of novels and stories imitating Austen's memorable characters or themes.